Mosquitoes and ticks are the main vectors for arthropod-borne virus (arbovirus) diseases. In North America the Culex mosquito species serve as the primary west nile virus (WNV) vectors, although ticks have been found to transmit it as well. The mosquito becomes infected when it draws a blood meal from a WNV infected host bird. When infected mosquitoes pass the virus to another bird. WNV spreads geographically when an infected host bird travels to a virus free mosquito population. WNV has become endemic in North America in a very short period due to bird migration. Within a week after a mosquito has taken an infected blood meal the virus replicates and accumulates in the saliva glands of the mosquito. 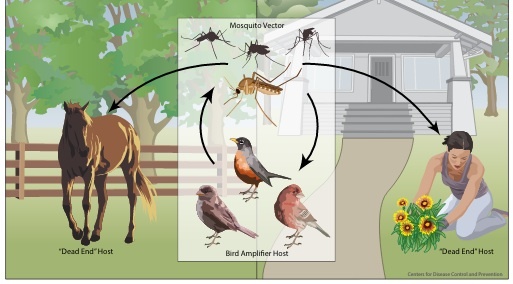 The infected mosquito becomes a vector for the transmission of WNV when it injects virus laden saliva into a bird host or a "dead-end host animal like humans and other mammals. WNV does not replicate to a sufficient blood titer for mammals to be efficient reservoir hosts. Hence, "dead-end host". Humans have a small but noteworthy role in the transmission of WNV. WNV can reside for a short time in the blood and tissue of asymptomatic humans. Therefore, exposure to infected blood and body tissue can transmit the disease. Transmission of WNV is possible through blood transfusion, needle stick, tissue transplant, transcutaneous exposure, breast feeding and transplacental inoculation. WNV is yet one more reason for the strict adherence to Standard Precautions. WNV is an arbovirus that is primarily spread by mosquitoes.